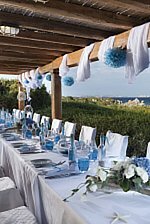 Sardinia offers many places where children and parents alike can have a safe and fun holiday in the perfect natural environment of gently shelving sandy beaches and shallow clear waters. Here is a selection of residences and hotels where children can meet other children and which offer special children's facilities such as seperate shallow pools, playgrounds, mini-clubs and activites, child-friendly restaurants, babysitting and air-conditioning. Safe places immersed in peaceful nature, a stone's throw from beautiful beaches. Peter Pan children's restaurant for lunchtime. Fantasy Village playground with soft sand. Shallow area for children at one of the other pools. baby kitchen facility for sterilising and warming up bottles, etc. Baby club from 18 months to 4 years, 6 days a week (medical certificate required). Mini & Junior club from 4 to 13 years, (6 days a week). Young club from 13 to 17 years with activities, games and sports (6 days a week). Free babysitting for children younger than 6 at the mini club between 20:30 and 23:30 for parents who eat at the restaurant Romantico, otherwise €12 per child for the 3 hours. Similar facility for 6 to 13 years old from 19:30 till 22:00 (but including dinner) is free. 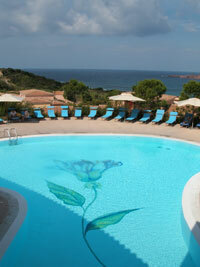 A luxury resort immersed in one of the most beautiful sceneries of Sardinia. A stone's throw away from 18 sandy and secluded coves. Mini club and child care from the age of 3. Mini and Junior Club included in the price for children from 3 to 12 years of age, 6 days a week, from 9:30 till 18:30. Large protected and well equipped play area for children. Dedicated restaurants for children. Mother & toddler room fully equipped to heat and prepare food for babies. After dinner entertainment for children. 2 swimming pools for children. Young club for children between 13 and 17 years of age with canoe, tennis and soccer lessons and championships and excursions to the country side. Evening shows for children in the amphitheatre. Mini-club for 4 to 17 years old from 28th May till 9th September (09:30–13:00 and 15:30–19:00, 6 days a week). “Baby dance” in the evenings. Sandy beach just across the road. Two swimming pools with lifeguards. Mini-club for 4 to 14 years old, open from 11th June till 9th September (09:30–13:00 and 15:30–18:30). Child-friendly restaurants with high chairs. Walking distance to village centre. For parents who want to take advantage of the spa facilities. Babysitting available. Mini clubs: 4 to 12 years old from 11th June till 9th September (10:00-13:00 and 16:00-19:00).